Adds the Ferrari LaFerrari to your Garage! Complete Rank 5 of the “Ferrari Owners Club” Driver Accolade to earn access to this car for use in all areas of the game. Adds the Startline Tour. All new players will now jump into a brand new Tour when they first play the game called Startline. The Startline Tour is available for free and features 11 events and 45 objectives. This Tour mainly serve as a varied and well balanced introduction to DriveClub and is based on some of the most popular and entertaining events from elsewhere in the game. Adds Multiplayer Race Replays to the game. You can now save a Replay at the end of any Multiplayer Race and view it later from the Replays menu. Adds a new Audio Settings option to change the acoustic settings for all cockpit cameras, so that you can change between internally recorded sound or externally recorded sound. Adds a new Single Event option to set “Time Of Day” for a Single Event to half past every hour as well as on the hour. Adds a new Single Event option to change the number of laps in a Race to any number from 1 to 25 laps. Adds a new Controller Settings option to allow adjustment of the steering lock rotation angle on all supported steering wheels. Includes general improvements to the game for better performance, stability and usability. The Rimac Automobili Concept_One, coming to PlayStation Store as a free download. 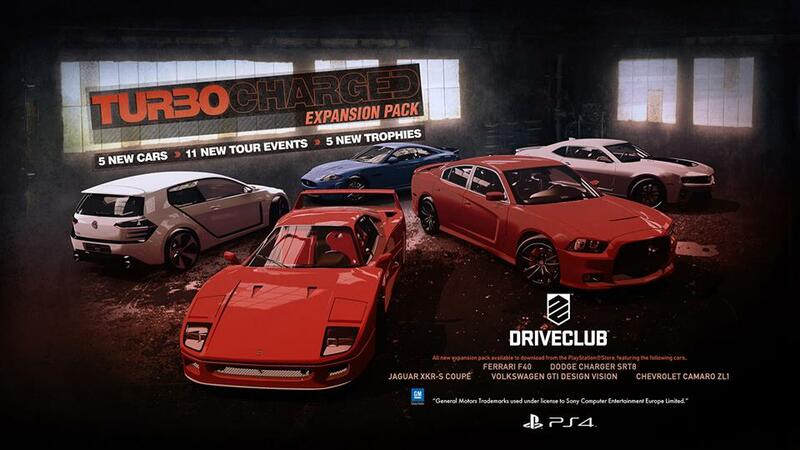 The Turbocharged Expansion Pack, coming to PlayStation Store as a Season Pass add-on (and also available to buy separately). The Turbocharged Car Pack includes: Ferrari F40, Chevrolet Camaro ZL1, Dodge Charger SRT8, Jaguar XKR-S Coupé and Volkswagen Design Vision GTI. The Turbocharged Tour Pack includes 11 new Events and 5 new Trophies. The Turbocharged Tour Pack includes a special bonus Livery, awarded when you collect 45/45 stars. 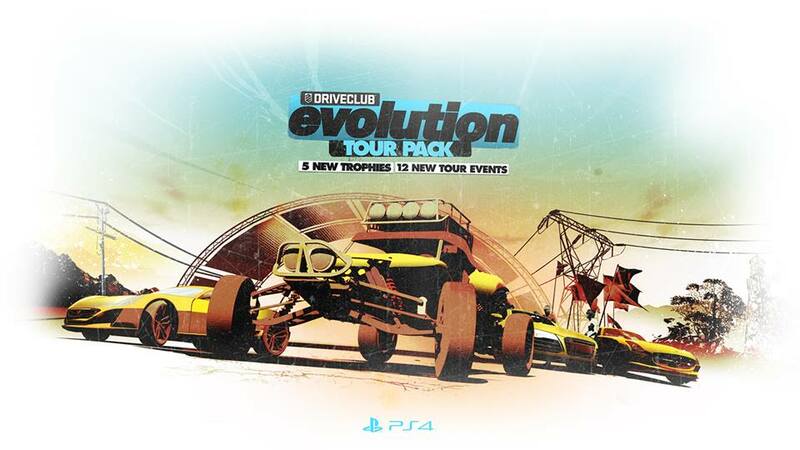 The Evolution Tour Pack, coming to PlayStation®Store as a Season Pass add-on (and also available to buy separately). The Evolution Tour Pack includes 12 new Events and 5 new Trophies. The Evolution Tour Pack includes a special bonus Livery, awarded when you collect 45/45 stars. 2 new livery packs, coming to PlayStation Store as a premium/Season Pass add-on. Each Livery Pack contains 5 new livery patterns to customize your cars with. I got to hand it to Evolution. They took what may assumed was the worst racing game on the PlayStation 4 and have been turning it’s perception around. It’s definitely one of the better racers out there for the PlayStation 4 or arcade racer lovers at that. Now if they could only get that DriveClub PlayStation Plus Edition released, oh and add a freaking Nissan Skyline to the game.